In 1875 B. A. Shepherd, a Houston banker and land speculator watched the plans of the proposed Houston, East and West Texas Railroad. Sheperd had a townsite platted in anticipation and even included a depot. In 1879 a post office was granted and by 1900 the town had 278 residents. During the progressive years, Shepherd抯 population rose to 500, only to decline after WWII to somewhere around 350. Shepherd has benefited from the building of Lake Livingston (finished in 1968) and the instant population increase it brought. From 900 in the early 1970s, it broke 1,600 by the mid 1980s. 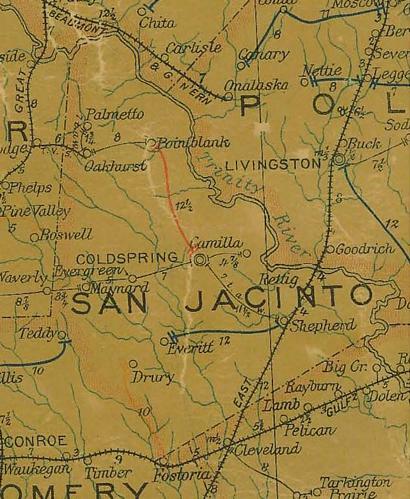 Shepherd抯 population eclipsed that of the county seat, becoming San Jacinto County抯 largest town. Shepherd was incorporated in 1967. The 1990 census reported 1,812 residents, growing to just over 2,000 for the 2000 count. Originated in vicinity of Old Drew's Landing, a Trinity River port for settlers bringing in goods and shipping cotton, tobacco, and other products to markets. An early nearby community was Big Creek. Into these pioneer settlements came Houston East & West Texas Railroad investors, including Benjamin A. Shepherd (1814-1891) of Houston, who in 1875 platted townsite here, naming it for himself. The town square was on west side of H. E. & W. T., which was completed beyond this point in 1879. The Shepherd Post Office opened Dec. 22, 1879, with Jack B. Noble as postmaster. A pioneer physician was Dr. William Herbert Beazley (1837-1919); Mrs. Jessie Fain operated an early hotel; Mrs. Jane Langham taught first public school session, in Methodist church building. James Ephraim Tribe, a native of Canada, came here in 1895, was a carpenter, coffin maker, millwright, and wheelwright. A Baptist, he built a church edifice for that faith in 1896. Distinguished native son Robert Scott Lovett (1860-1932), became president of Southern Pacific and Union Pacific railroads and rendered outstanding civilian service to the nation during World War I. Once a center for the lumbering industry, Shepherd remains an important market town of southeast Texas.